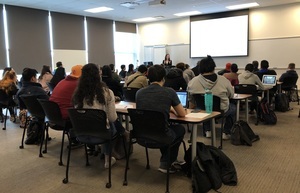 Bridgeport, CT - The Housatonic Community College Foundation has received a $10,000 grant to respond to the financial literacy needs of its students. The grant, awarded by Bank of America, provides funding for a series of financial literacy workshops and a Financial Reality Fair. Founded in 1990 by a team of business and arts leaders from the greater Bridgeport community, the HCC Foundation is a 501(c)(3) non-profit organization that solicits, secures and manages contributions from the private sector through individuals, corporations and foundations for the benefit of HCC. The HCC Foundation distributes resources in the form of full and partial scholarships to students with proven academic performance and demonstrated financial need.